The Japanese artist Tatzu Nishi invites the public to interact with public objects in novel ways. Over the years, he has constructed a temporary one-room apartment around a bronze angel weather vane atop a 14th-century cathedral in Basel, and enclosed a 4.5-meter- high statue of Queen Victoria in Liverpool to make it the centerpiece of a temporary hotel room. For the Singapore Biennale 2011, running until May 15, Mr. Nishi has transformed the 8-meter, or 26-foot, white cement Merlion, a tourist landmark, into the centerpiece of a luxurious hotel suite. The suite, built around the usually water-spouting half-lion, half-fish beast, comes complete with a bathroom, balcony overlooking the Marina Bay and a dedicated butler from the nearby Fullerton Hotel. 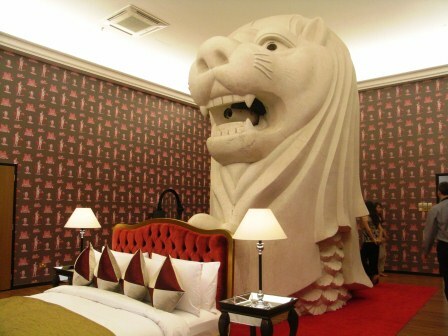 During the day the room is open to the biennale public, while at night, a few lucky guests can sleep under the statue’s leonine head, which bursts through the floor in a décor wallpapered with a Toile de Jouy pattern that mixes motifs of Sir Stamford Raffles (who founded Singapore), the Merlion and a Chinese temple. Mr. Nishi, who started this practice to bring his art closer to the public and is also working on a living room project in New York, said he liked to “make the public private” by creating an “inside” around a space that is perceived as “outside.” The 32 nights made available to the public for 150 Singapore dollars, or $120, a night sold out in an hour. The third Singapore Biennale should have been staged last year but was postponed so that it would not coincide with the Youth Olympics, which were held in Singapore. The biennale, which features 63 artists from 30 countries and 161 artworks, aspires to be international, but it still has a strong Asian flavor — 57 percent of the artists are from the Asia-Pacific region. And while the previous biennale’s theme, “Wonder,” favored aesthetically pleasing and more accessible works, this year’s biennale is taking a slightly more difficult conceptual tack. One of the commissioned works is a new installation by the Thai artist Arin Rungjang, “Unequal Exchange / No Exchange Can Be Unequal.” The artist has created a large living room that will continue to change using a system of exchange in which he invited Thai workers in Singapore to “re-furnish” the space by swapping a piece of furniture from their home with one of his initial pieces from Ikea. The process is to be documented over 64 days with daily photographs added to the wall. Mr. Rungjang said he was interested in exploring social and economic mobility through this work. 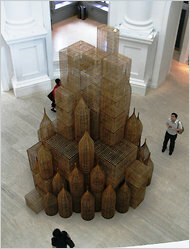 In another commissioned piece, Compound, the Cambodian artist Sopheap Pich used bamboo and rattan to create a fictional city surrounded by bombs, alluding to his country’s still recent violent history. 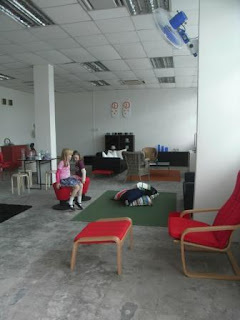 "Open House” is presented across five different spaces including the city-state’s first civil airport terminal. The airport was closed in the 1960s and had been used until 2009 by the People’s Association, a community group set up by the government to foster racial harmony. One of the most visually appealing works is an installation by the Vietnamese artist Tiffany Chung, who as a small child experienced firsthand the 1978 flooding of the Mekong River. She rethinks urban planning with a utopian miniature floating city, inspired by vernacular architecture from across Asia. Her project proposes flat sustainable living using local materials, eschewing futuristic high-rise designs that are alien to local habitats. The large installation hangs from the ceiling to appear as though it were floating on water and is complemented by the artist’s jewel-decorated cartographic works of Vietnam. Read the whole story in the IHT .